There are a few people in our lives who touch our souls and leave a mark forever. Christine Tanguli is one of those people. 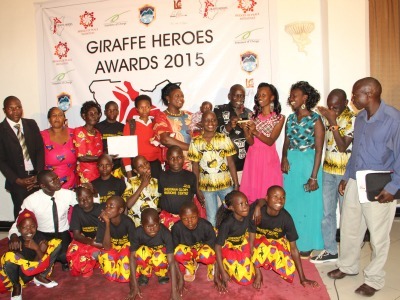 The Giraffe Heroes Award was created to honor these types of people – the change makers. It was created to honor people who are working to develop struggling communities around the world, and especially to thank and encourage people who take a stand for the less privileged in society like orphans, widows, and young single mothers. When Christine received the award she was left speechless and tears of joy rolled down her face. She was amazed she was the person, out of everyone nominated, to receive the Giraffe Heroes Award. Christine dedicated the award to the Kinship Home caregivers and their tireless and thankless work to the Kinship Homes. She thanked the caregivers who were at the event with her and said they were the ones who truly deserved the award. The ceremony took place in Nakuru, Kenya. Christine was joined by her husband Ben (Kinship United’s Founder in Kenya), 10 kids from Kinship Homes, and a few caregivers from the Kinship Homes to attend the event. She wanted to celebrate the night with her Kinship Community because they are the reason she won the award. Christine was nominated by Mount Kenya University since a number of their students were helped by Christine. Many of them were from Gilgal Kinship School, in the Ephraim Kinship Project, where Christine has done a lot of work over the years to ensure every boy and girl could pursue higher education and to encourage the students to believe the sky is the limit! The event was such a beautiful picture of Kinship and an amazing testament of how powerfully God is working through our Kinship Projects in Kenya.